Bruce Bartlett writes today that a Romney-style tax reform, where you lower rates and eliminate deductions, is a pretty good idea. In theory, it should produce higher economic growth. 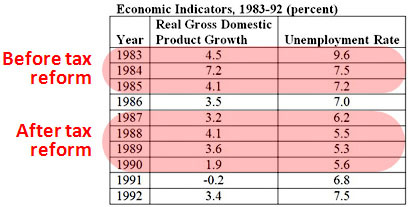 By the mid-1990s, it was the consensus view of economists that the Tax Reform Act of 1986 had little, if any, impact on growth. In an article in the May 1995 issue of the American Economic Review, the Harvard economist Martin Feldstein, a strong supporter of tax reform who had served as chairman of Reagan’s Council of Economic Advisers, found large changes in the composition of income, but the only growth effect was a small increase in the labor supply of married women. Even if you assume that Romney could manage to make his tax numbers add up (he can’t), and even if you assume his plan has any serious chance of getting through Congress (it doesn’t), it wouldn’t do much for growth. Rationalizing the tax code might be a good idea, but it’s not the answer to an economic downturn. Romney should focus more of his attention on jobs and less on the endless conservative obsession of lowering taxes on the rich at all costs.